Rom means “law” or “culture.” When a Yolŋu elder, now deceased, was asked to speak to Yirrkala School staff about Yolŋu curriculum, he pointed out that all Yolŋu knowledge needs to be understood through five dimensions of rom. He was a Djapu man who was speaking about his own totem, the shark. But these dimensions, he said, are relevant to all Yolŋu education. It was the ancestors of the many Yolŋu groups who created the land as we know it as they sang, danced, talked and moved along their dreaming tracks. The ancestors actually changed their language as they arrived at each new territory, and created new groups of land-affiliated Yolŋu, related to others along the same “dreaming” track. These ancestors were all either Dhuwa or Yirritja. The "five dimensions of rom." Yikaki Maymuru with art of his Maŋgalili clan. Yolŋu can tell from each other’s language, art, song and dance which part of the land they belong to. 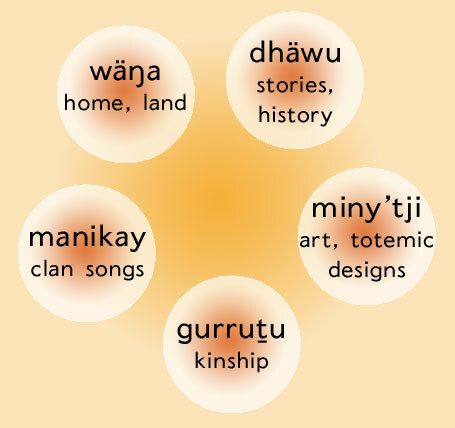 Each territory has a history, encoded through stories and songs in a language which belongs to that place. These link the land and people to totemic species – plants, animals and physical phenomena. The ancestors also passed down sacred designs, some of which are secret, or have secret meanings. These designs have been painted on people’s bodies, carved and painted on sacred objects, moulded into the earth, and more recently painted with ochres and acrylics on to barks and canvases. The stories, songs and the art all specify both the differences and the connections among groups. On this website, Yolŋu are sharing some of their rom with you in the hopes it will increase your understanding and respect of the yidaki and its place within their culture. It all belongs very specifically to these Yolŋu clans. Yolŋu from one clan can not simply decide to take songs, designs, land or any other resources from other Yolŋu clans – it would be the ultimate crime. You should behave the same way. Even the simplest art painted on yidaki belongs to the person who painted it and is not to be copied. According to copyright law and decent ethical behaviour, Yolŋu music that has been recorded and released on CD is still owned by the artists just the same as music sold on CDs by western pop artists.